The curve of St Patrick’s Street follows the line of a river that once flowed freely along it. In fact, you’ll be running on top of old rivers for most of the first mile! St Patrick’s Street, the Grand Parade, the South Mall, Parnell Place (once known as Nelson’s Quay) were all rivers until they were culverted and paved over in the 1780s to cater for the expanding city. St Patrick’s Street has held many historic gatherings over the years with rallies from political figures such as Charles Stewart Parnell and Michael Collins. Many of the buildings were destroyed during the Burning of Cork in the War of Independence in 1920. Today it stands proud as the main street in Cork City where the City Marathon both starts and finishes. The first mile makes its way from St Patrick’s Street to the Grand Parade, past the World-renowned English Market on your left-hand side. It winds its way left onto the South Mall and left again onto Parnell Place and onto Merchant’s Quay. The first six miles of the race are flat, so enjoy. Just after the one-mile mark is Cork Opera House on your left-hand side. Opened in May 1855, the original theatre on this site played host to some of history’s great figures. Charles Dickens gave two lectures here in the early years when it was known as the Athenaeum. Charles Stewart Parnell also addressed a meeting here. In 1955 it was razed by a fire that left Cork without an Opera House for over a decade. Reopened in 1966, it was remodelled again in the 1990s. 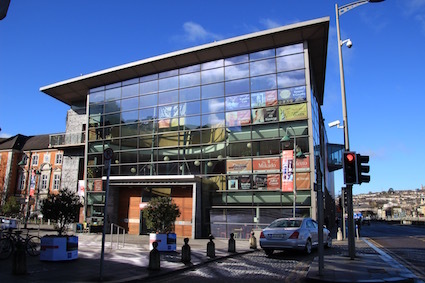 Today, Cork Opera House is southern Ireland’s premier venue for the best concerts, comedy, drama, dance, family fare and, of course, opera! We take a right across Christy Ring Bridge and head out towards historic Blackpool. Following Sinn Fein’s victory in the local elections of January 1920, Tomás Mac Curtain was elected Lord Mayor of Cork on 31 January 1920. His tenure as the first Republican to hold the office, however, was cut short. In the early hours of his 36th birthday, on 20 March 1920, members of the RIC (the Royal Irish Constabulary) burst into his house in Blackpool and shot him dead in front of his family. The shocking murder brought near universal condemnation. At the coroner’s inquest into the killing the jury passed a verdict of wilful murder against the British Prime Minister, Lloyd George, and various members of the RIC. Just before the Church of the Annunciation on Great William O’Brien Street, a monument to Mac Curtain stands on the right-hand side outside the Baldy Barbers’ shop. You’ll pass Mac Curtain’s house where he was murdered shortly after the two-mile mark, on the left-hand side just as you come onto Thomas Davis Street. It’s commemorated by a plaque over the Daybreak shop, opposite the church. 3 MILE MARK: Look left and be thankful that you only look up St Patrick’s Hill and don’t have to run up it! Some of the world’s best cyclists have raced up St Patrick’s Hill, with its 25% gradient towards the top, over the years – from Sean Kelly, Stephen Roche and Sean Yates, in the Nissan Classic in the late 1980s and early 90s, to Frank and Andy Schleck, in the 2007 Tour of Ireland. In 2009 Lance Armstrong famously decided not to risk the tricky ascent during a torrential downpour. Today you are lucky – keep running along the flat banks of the River Lee and enjoy one of the flattest Marathons in Ireland. No climbing St Patrick’s hill for you! On the 4-mile mark along the banks of the lovely Lee look to the left and you will see a beautiful row of terraced houses called Myrtle Hill Terrace. Count 13 houses from the left and there is a house steeped in history. 13 Myrtle Hill Terrace was used as a safe house for Terence MacSwiney during the War of Independence in 1919/20. Terence MacSwiney was elected Lord Mayor of Cork in March 1920, succeeding the late Tomás Mac Curtain. In August 1920, he was convicted of possession of seditious material and died in Brixton Prison in October after 74 days of Hunger Strike. After registering for the marathon in City Hall, you’ll exit the main Concert Hall onto Terence MacSwiney Quay. MacSwiney and Mac Curtain are commemorated by two stone busts looking proudly over the river outside the City Hall. As you pass the first Relay Changeover area and the Clayton Silver Springs Hotel on the left-hand side you are now in the leafy city suburb of Tivoli. The Cedar Trees in the area are reputed to have been planted by Sir Walter Raleigh. The Port of Cork dominates the riverside by Tivoli, with its container-handling facilities for oil, livestock and ore and car-import point. Until the 1980s, the Swansea-Cork ferry docked at the roll-on/roll-off ramp here. Roughly halfway along the Silversprings dual carriageway, you cross over from the City into the County of Cork. So far you have run 6 flat miles. The good news is that there’s another flat bit ahead for you to enjoy. From the six-mile marker you are about to experience something unique. You are now about half a mile away from entering the Jack Lynch Tunnel, named in honour of an accomplished local sportsman and later Taoiseach. The Jack Lynch Tunnel is an immersed tube tunnel. It’s part of the South Ring Road (N40). The Tunnel takes the road under the River Lee and connects the South Ring Road with the M8 to Dublin, the N8 Road to the City Centre (which you’ve just run on) and the N25 to Waterford. It’s a unique experience running in an underwater tunnel. The north-bound bore is closed to traffic for the duration of the race, so enjoy it and don’t forgot to holler OGGY OGGY OGGY, OI OI OI ! After all that excitement, as you approach the 7-mile marker you begin to see light at the end of the tunnel (sorry couldn’t resist). Just 19 more miles to go! We now have a hill out of the tunnel and onto the N40. After 6.5 miles of dead flat it’s time to give the legs a small bit of a warm up in the tunnel. This hill isn’t too bad and flattens out relatively quickly after you exit the tunnel. 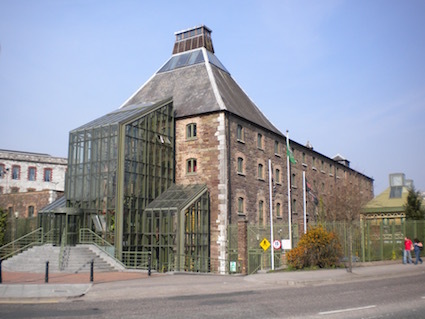 If you are visiting Cork for the weekend and fancy some out-of-town shopping, you are in the right place. You now take the slip road up past Mahon Point Shopping Centre. You won’t have your wallet or purse with you but that’s ok, it’s not open yet anyway. Call back after the race when it’s open and reward your efforts with a cup of coffee and get yourself something nice to remember your achievements in Cork. Some more flat running for you now for the next few miles through Mahon and Blackrock. Mahon and Blackrock are proud sporting areas steeped in the traditions of Hurling, Boxing and Golf. Mahon also boasts an 18-hole golf course. Something to do tomorrow perhaps! The second Relay Changeover point is just after 10 miles. Just before the 11-mile mark you’ll see the picturesque Blackrock Castle ahead. Perched on the shore of Lough Mahon, the castle was originally built as a fortified defence in the 16th century to protect the upper harbour and port. The castle was destroyed by fire twice, in 1722 and again in 1827, after which the castle as we see it today was designed by James and George Pain. Within the castle, you can explore the universe at the CIT Blackrock Castle Observatory, or enjoy a meal in the Castle Café and Restaurant in the courtyard – a lovely setting away from the hustle and bustle of city life. After the Castle you enter the flat walkway that sweeps along the edge of Lough Mahon. We are being very good to you, another flat mile completed as you pass the 12-mile mark. Take a look around and ask yourself, ‘have I ever run a City marathon in such a nice place?’. You have the beautiful River Lee estuary to your left and across the water are Rochestown and Passage West. Next up it’s time to catch the train! Just before the 13-mile mark we leave the Lough Mahon walkway using a steep bridge over the N40. But don’t worry, it’s just a short, steep hill and the rewards are worth it. Down off the short bridge and you enter the Old Cork to Passage West Railway line and another dead flat section. This is a spectacular section of the course. This is Greenway heaven! You get about a mile and a half of this, so enjoy it. After the old railway line and approx 14.5 miles into your journey you come out onto the Marina. You are now on the banks of the River Lee again, directly across from where you were on mile 5. Now you have another feast in store. You are approaching the Historic Cork GAA Grounds Páirc Uí Chaoimh on the left. The redeveloped stadium opened in 2017, when we moved to the Sunday. We are grateful to the Cork and Munster GAA for rescheduling their matches to accommodate our marathon and allow us run past this beautiful stadium today. This is the heartbeat of Cork GAA and has hosted legends of the game since its original opening in 1976. Cork Legends of Hurling and Football, such as Ray Cummins, Jimmy Barry Murphy, Teddy McCarthy, Brian Corcoran and Seán Óg Ó Hailpín to name but a few, created some magical moments here over the years. In fact legends of music have also played here including Michael Jackson, Prince, Bruce Springsteen, U2, The Stone Roses, Paul Weller and Oasis. In May, Páirc Uí Chaoimh plays host to Ed Sheeran. If you are in Cork for the Marathon this year, why not attend the big Munster Hurling Championship game the night before the Marathon? With the home side taking on Limerick, this will be a fascinating encounter between two up and coming teams. Flat again all the way to the 16-mile mark via the Centre Park road where in October 2017 Storm Ophelia wreaked havoc knocking 27 trees. The third Relay Changeover takes place here at the end of the road. This is a noisy spot so soak in the atmosphere as you come back into the City via the old Jewish Quarter. As you approach the 17-mile mark there is a gentle hill out the N27 South link Road. We have to ask you to climb a sharp hill too, right on the 17-mile mark. You have been getting away with it up until now but to get back across the city we need to climb a short, sharp slip road up towards Turners Cross. This hurts, we won’t lie. However, it’s very very short and over very soon. After an almost completely flat 17 miles so far I’m sure you won’t hold a small hill against us! At the top of this hill you arrive downhill into Turners Cross. Turners Cross is best known for the football ground of the same name on your righthand side. It’s home to the current League of Ireland Champions Cork City FC. Visiting Turners Cross is a rite of passage for most Cork people. The club boasts a proud tradition, with Hall of Famers Dave Barry, John Caulfield and Pat Morley household names for their exploits at ‘The Cross’. Another stadium on the 18-mile mark. This time it’s Munster Rugby’s second ground, Irish Independent Park (formerly Musgrave Park) on the righthand side. Rugby has a proud tradition in Cork with international household names such as Donal Linehan, Ralph Keyes, Ronan O’Gara, Peter Stringer and Donnacha O’Callaghan adorning the rugby fields of Cork, Munster, Ireland and the World! We haven’t spoken about hills much because quite frankly they have been few and far between. However we’ve got one here on the 18.5-mile mark. We are now in Ballyphehane, one of the early suburbs of Cork. Many of the main roads through Ballyphehane are named after the executed leaders of the 1916 Rising. Our hill is on Connolly Road, named after James Connolly. The climb itself could be described as a flat lead-up to a medium distance, medium gradient climb. It flattens out as you reach the 19 mile Mark. The compensation is that this is a truly Cork suburb, with fantastic local supporters who’ll cheer you up that hill! After roughly 19.5 miles you approach The Lough to your right. There aren’t many bodies of water identified simply by their geographical description but this is one. Everyone in Cork knows where The Lough is! It defines the area, and rightly so. It’s a shallow freshwater lake that’s one of the oldest official wildlife habitates in Ireland. Designated in 1881, it’s the protected home for numerous species of wildlife. Give a wave to the swans as you run past. The 20-mile mark is up ahead. From the 20-mile mark to 20.5 you are running downhill. Enjoy it, and it’s time to take a nice breather before the last climb of the day on Farranlea road. It’s our version of Heartbreak hill except it’s not really all that bad. More like a mild romantic disappointment rather than heartbreak! I tend to split this climb into three. It’s best described as one short, sharp climb followed by a plateau. A second long, light, almost flat gradient climb followed by a high, short step at the end. Confused? Don’t worry. You have the worst of the climb over you when you reach the top of the hill behind County Hall. When you come out towards Model farm Road there is a very short, sharp step up onto Model farm road. You’ve 21 miles down and the remaining 5 miles are flat. 22 MILE MARK: The Last Leg! The final changing of the Relay guard takes place close to the 22-mile mark near CIT on the Model Farm Road. More noise and excitement as you pass through the final Changeover. You know that the hills are behind you and glory is ahead. We now take you down a quiet country lane just to cover off everything. You’ve run on every kind of road Cork has to offer from bridges to tunnels, railways, greenways, motorways and now the country boreen! Get some fuel on here before you exit onto the Straight Road. You are now on the Carrigrohane ‘Straight’ Road (N22). As the name suggests, it is straight – you have a full mile, dead straight and dead flat, ahead before you reach the County Hall. Built in the mid-19th century, the Straight Road was served by trams in the late 19th/early 20th centuries. In the 1920s, it became one of the first concrete road surfaces in Great Britain or Ireland. Because it was built on a flood plain, the road and its surrounding areas have seen dramatic flooding, most recently in 2009. The Straight Road used to be part of a Grand Prix Circuit, believe it or not! Combined with the Model Farm Road, it made for a nice looped circuit where The Cork Grand Prix was held in the late 1930s. The 1936 race was the first ever motor race in Cork, and by 1938 Cork hosted the only motor race ever in Ireland run to the then new International F1 rules. It was won by GP legend René Dreyfus of France, in a 4500cc Délahaye 145, averaging speeds of almost 93mph. Just imagine a former Monaco GP winner tearing down the Carrigrohane straight in an F1 car today! Due to the flat surface of the Straight Road, it has also proved suitable for motor bike and car speed trials, where the Irish Land Speed record was set many times. The Carrigrohane Straight hosted the finish to a stage of 1998 Tour De France. This Dublin to Cork stage was won by the Mapei rider Jan Svorada, in the year that the late Marco Pantani won the Tour. Enough talk of speed. At this stage in your run, you are no doubt going a lot lot slower than René Dreyfus or the Tour De France Peloton! You have got there. It’s County Hall. At one stage while you were running along the Straight Road you thought it was getting further way. But it’s here now. County Hall is the administrative headquarters for Cork County Council. The 67m-storey building opened in 1968, but the cladding was extensively redeveloped in the early 2000s. Oisín Kelly‘s statue, Two Working Men, stands outside the complex. After County Hall you hang a left at the AIB Bank and a right down the Mardyke past the Mardkye Arena and the Sonia O’ Sullivan Track, named in honour of the Legendary runner from Cobh. Sonia won a host of titles from Gold Medals at European Championships for 3,000, 5,000 and 10,000 meters, Gold at the World Cross Country Championships for 4k and 8K, Silver at the 1993 World Championships in Stuttgart for 1500 meters and of course Gold at the 1995 World Championships in Gottenburg over 5,000 meters and Silver in the Sydney Olympics in 2000 for 5,000 meters. Further along the Mardyke is Fitzgerald’s Park on the lefthand side. A public park, Fitzgerald’s Park is also home to the Cork City Museum which is well worth a visit. 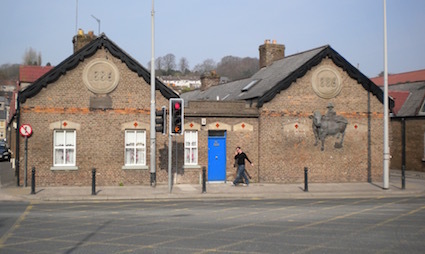 The 25-mile marker is at the end of the Mardyke after you turn left, just as you approach the walkway known as Slí Cumann na mBan (the Republican Women’s Council). Commemorating women’s role in the establishment of Irish Independence and of the Irish State, it’s particularly pertinent in this centenary year celebrating Irish women’s right to vote and the appointment of Countess Markievicz as the first female elected to Parliament. After the 25-mile marker, you cross the River Lee and into the heart of Medieval Cork. You’re possibly feeling that ancient at this stage but hold on, you are almost there! The hint is in the name – you cross the North Gate Bridge and the site of the City Gate Prison that guarded the northern approach to the medieval City of Cork. Your flat run along North Main Street, with its dozens of ancient laneways left and right fossilised in the modern street layout, will be slightly enlivened by cobbled stone ramps. If you have the energy as you approach its end, you might glance down Castle Street on your left – it’s the street that was once yet another waterway and one that gives Cork its Coat of Arms and its motto Statio Bene Fide Carinis, a Safe Harbour for Ships. It’s hard to believe you’re running on what was once a defended medieval island surrounded by marsh! To square our marathon circle, our venerated Lord Mayor Terence MacSwiney, encountered four miles into your journey, was born on North Main Street. At the end of North Main Street you take a left onto Washington Street and left again to finish on St Patrick’s Street. You are back where you began and have achieved something great. You have completed the Cork City Marathon! Just after the 1-mile mark you'll run past the Cork Opera House on your left, as you turn right onto Christy Ring Bridge. A vibrant performance arts venue, they also have a seriously good restaurant called House! On Watercourse Road, Murphy's Brewery, established by James Murphy in 1856 and now owned by Heineken, was known as Lady's Well Brewery after an ancient holy well that overlooks your run from high up on your righthand side. 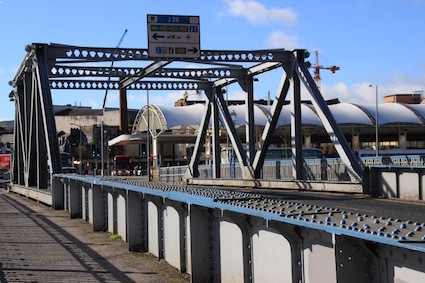 Clontarf Bridge, off Patrick's Quay, is a Scherzer Rolling Lift Bridge. Built in 1911, though it no longer lifts, it's the same construction as the Chicago River Bridge. As you leave Blackpool Village and head back for the quays, you'll pass Madden's Buildings on your right. Built in 1886 to re-house people from tenements in the city centre, these terraced houses introduced the concept of one family, one house to people who had lived in dire circumstances in cramped conditions.